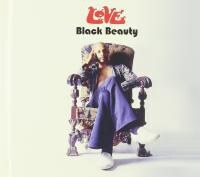 Black Beauty, now on CD for the first time, may have a totally different sonic palate than Forever Changes or Da Capo, but it's similarly built around Arthur Lee's emotionally revealing lyrics and careful pop sensibilities. Black Beauty was recorded in 1973 but never officially released on CD. Considering how much Love frontman Arthur Lee seemed to revel in sharing his music, there's something sad about how this album sat on the shelf. Now that it's been released on vinyl (originally in 2012) and on CD, we can finally enjoy this record and hear a whole new side of the Love sound. High Moon's version pays tribute to this record with bonus cuts, a 62-page booklet, and 35 never-before-seen photos in the package. The album itself proves worthy of that kind of tribute. Black Beauty came out of a particularly tough time for Arthur Lee. His solo album, Vindicator, flopped in 1972, and so the new Love line up arose out of doubt and seeming failure. It may have been a long road from there to Black Beauty -- that story is well told by Ben Edmonds in the liner notes -- but the album sounds like Lee and company emerging from that doubt and into a newfound, powerful sound. Lee is joined on record here by guitarist Melvan Whittington, bassist Robert Rozelle, and drummer Joe Blocker. The foursome sounds pretty far removed from Love's classic 1967 record, Forever Changes. Forever Changes was all lush, West Coast sway -- a brilliant pop record top-to-bottom. The four players on Black Beauty charge headlong into blues rock volume. Opener "Young & Able (Good & Evil)" starts with psychedelic notes and echoing space, but as Lee tells us he's been "drinking, travelling, thinking 'bout the seventh sun," the song erupts into a crunching rock number. Blocker's drums thunder behind the band, while Rozelle's bass glides serpentinely through the track. The guitars don't shred over the rhythm so much as they get tangled into it. Meanwhile, Lee howls every line with impressive urgency. The energy doesn't come down on "Midnight Sun", which starts with a squalling guitar solo, but settles into a bluesy groove, one every bit as propulsive as the first track. It's clear at this point that Black Beauty is a pure rock record, but it's not above stretching the limits of this new direction. "Can't Find It" reimagines the lush, quieter moments of Forever Changes into a rock ballad. Yet again, Lee is in search. "There must be something in this lonely world for me," he pines, putting language to the yearning that makes these songs so immediate, so compelling. Lee's vocals range from intimate to bellowing on the track, imitating the psych-rock fills of the guitar, giving them a sort of vocabulary. All that laid-bare emotion sets up a nice contrast to the clear-eyed confidence in the percussive thump of "Skid" or the ringing guitar jams of "Lonely Pigs". Black Beauty may have a totally different sonic palate than Forever Changes or Da Capo, but it's similarly built around Lee's emotionally revealing lyrics and careful pop sensibilities. The rock energy of the songs beefs these compositions up, even scuffs them at the edges, without obscuring their shape. Not all the explorations away from the album's rock center work, like the awkward shift into reggae on "Beep Beep". Other moments, like "See Myself In You" feels a bit by the numbers in comparison to the album's more dynamic tracks. So while minor stumbles might keep this from the definitive classic status Forever Changes enjoys, this is still an important record by an important band. The extra tracks here add some solid context to the record. In live cuts, especially the hard-hitting "Everytime I Look Up, I'm Down", we see the muscle of this band on stage, even if the recordings are a bit muddled. The best extra track here is actually an interview with Lee, one where you hear the disarming man behind all of these songs. Black Beauty is an album that needs to be out in the world, that needs to be celebrated. It doesn't have to be a new classic in the Love discography. It just needs to be another interesting chapter in the band's story. It is that and then some.